Hi there, and thanks for this write-up! I’ve been specifically looking for a way to publish trusted sites via group policy and still be able to let users add their own sites. Can I substitute a * for www so that all subdomains of that domain would also be trusted? This will show up as http(s)://*.website.com in Internet Explorer. 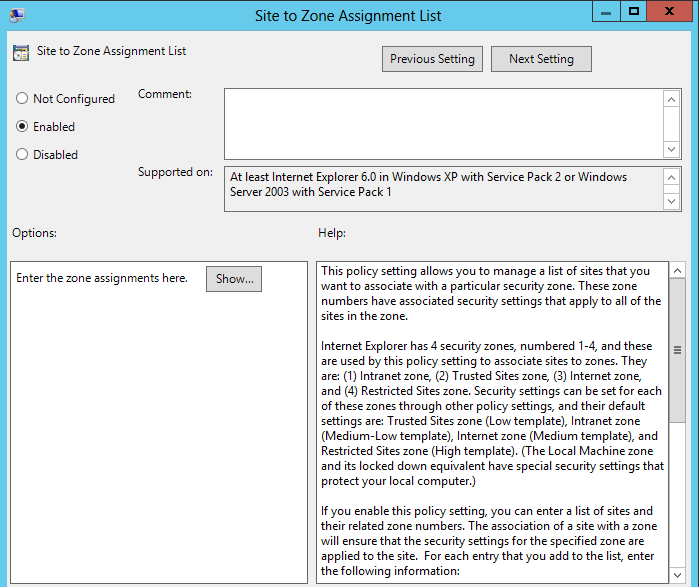 At solution with Site to Zone Assignment List can be setup more than one sites in Trusted zone with 2 value? Yep, as soon as you type starting in the first row another will appear. Which translates to this on the client. I ran into a problem where setting this to 67 did more than just untick that option. Apparently the Flags registry value this is a bitwise value, and thus multiple settings are contained in this one value. you need to add the numbers in the table at the bottom of this page to get the desired value: http://support.microsoft.com/kb/182569. In other words 67 decimal may not really be the value you want as it may change other settings as well. I also believe the list at the bottom of that page is not complete as I’ve seen values as high as 327 (1+2+4+8+16+32+128 <327, so some other settings are also included in this value). I know this doesn't give people the right answer, but it may help in a situation where things are not set right and you don't know why. 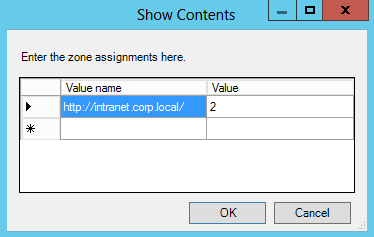 We currently deploy intranet zone mappings through Group Policy. After updating to IE 11 this last week, this policy causes a Page Cannot Be Displayed error for most clients. This only occurs when a specific site is mapped to Intranet Zone. Have you seen this anywhere else? Maybe know of a fix? Matt, you’d have to go through your Intranet Zone settings to try and figure out which setting is causing the issue. Hard to suggest much else without looking at the site and your configuration I’m afraid! Are you pushing this via the Site to Zone Assignment List or via Group Policy Preferences Registry Items? If you’re talking about this setting -> Administrative Templates -> Windows Components -> Internet Explorer -> Internet Control Panel -> Security Page -> Site to Zone Assignment List, then your assumption is correct. If it is applied at the computer level, every user that logs onto that computer will get the policy. I always recommend having a test OU structure to confirm these types of things in your own environment. Sweet tip for adding without locking out users from the settings. Saved my bacon. Thank you! I have enabled this group policy at the top of my departments tree, but would like to give my tech support engineers the freedom to add and remove sites from Trusted and Intranet for troubleshooting purposes so I would need to disable this at our OU. Lin, create a new GPO at the required child OU and set the Site to Zone Assignment List setting to ‘Disabled’. 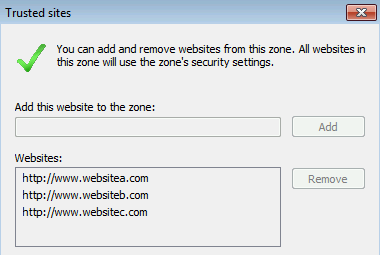 This will prevent your support engineers from applying the Site to Zone policy settings from your other policy and allow them to add/remove sites as required. I just used this to tediously add 40 sites to a car dealship’s IE exceptions…… While extremely time consuming it worked perfectly! great walkthrough! The EscDomains is necessary when using the Internet Explorer ESC mode. I’ve created GPO with trusted sities, and of course i can’t add it anymore on user machine. I’ve created registry rule, but it didn’t work – i still can’t add sities by end users. Still have message in IE that some settings are managed by domain. Run gpresult with the /h switch and search through the results to make sure “Site to Zone Assignment List” isn’t configured elsewhere. Failing that make sure that the machine is getting the new GPO (again with gpresult). Instead of making a Reg_word for each site, I exported the “Domains” key from a PC that had all the correct trusted sites to a shared drive and then created a logon script that copies it to the local machine and then imports it to the registry. 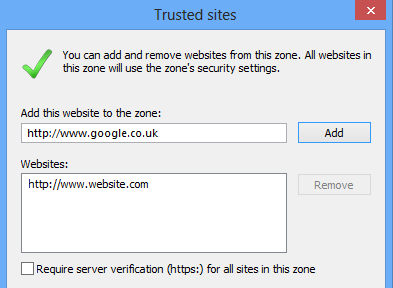 Now, whenever we need to add more trusted sites, I can just update the reg key in the shared location. Hey Tom!!! This post really saved me from blocking users access to IE security zone and achieve what we IT dept. want to apply. I am trying to fix a document management database issue and the tech support rep said to try it. Oh, and I did add the registry item to allow http before the item to request a new address. Thanks for replying. Good to know I have it set up right. Now to figure out why it’s not working. It is linked to the Computer Users group and I turned on “Enforced”. I’ve run gpupdate /force, rebooted..
Not sure I quite follow with the “Computer users group”. You would generally link this GPO to an OU containing users (unless you’re using loopback processing). You shouldn’t need to Enforce the GPO unless you’re using Blocked Inheritance. If you need help troubleshooting, check out my GPResult Examples post. 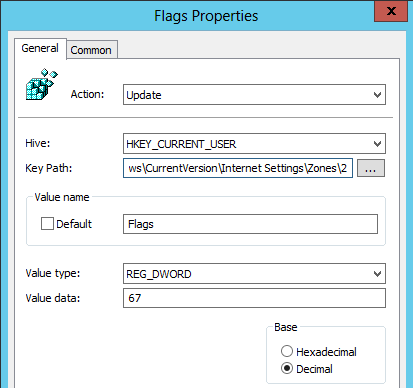 the registry key method is working great for windows 7, windows 10, and server 2008 R2. 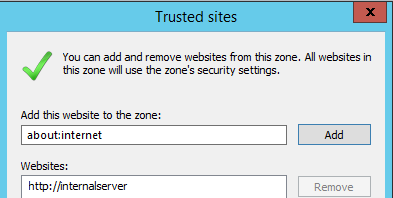 but on server 2012 R2 and server 2016, while I see the registry keys being correctly applied in regedit, none of the sites actually appear in trusted sites or intranet sites in IE (and they aren’t getting treated as trusted sites or intranet sites). I have tried adding the sites to both the “domains” key and the “escdomains” key. but IE on server 2012 R2 and server 2016 is ignoring the registry keys. 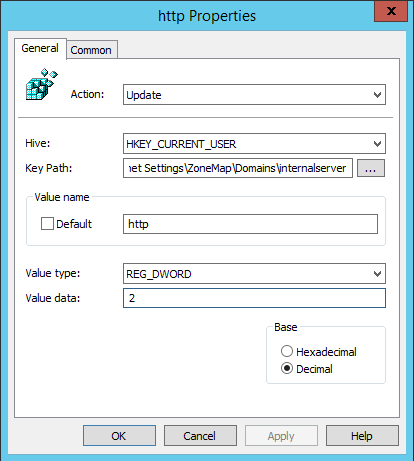 You have to set the “ieHarden” dword to zero for server 2012 and up remote desktop sessions to respect the registry zone mapping. 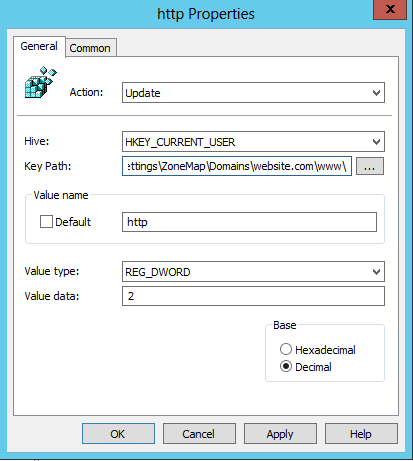 If ieharden is enabled/set to 1, ie will ignore the registry zone mapping. ieHarden may just be the key. When a list of sites and UNC paths are applied via GPO , the list of sites is empty in IE whether Trusted Sites or local intranet. But your site list is populated in IE. Any idea why the list of sites is empty?